MODERN APARTMENTS AT THE SEACOAST. Experience modern living in a beautiful setting in highly desirable Dover, NH. At Pointe Place, you can surround yourself with the latest in modern design and comfort to make you feel at home. 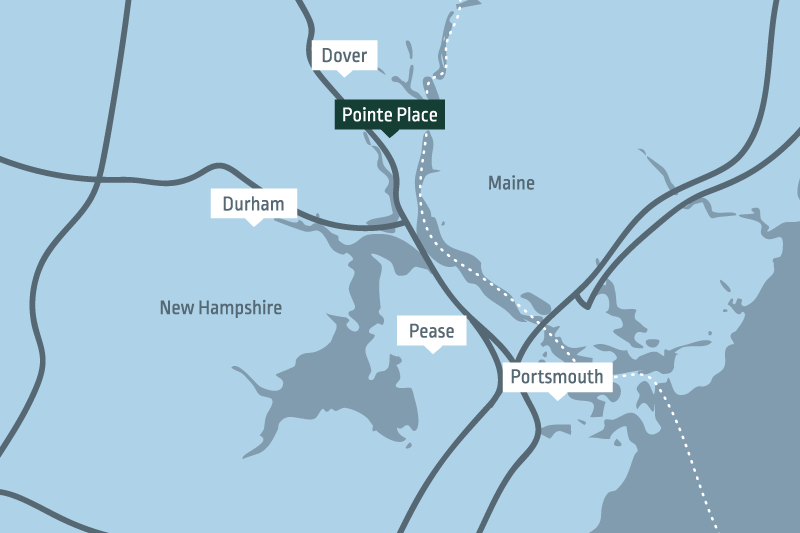 Pointe Place is conveniently located minutes from downtown Dover, the Seacoast, airports and a quick jump onto 95. Why waste time commuting? Discover an exceptional living experience at Pointe Place. From gleaming floors to granite counter-tops and stainless steel ENERGY STAR® appliances, Pointe Place offers the finest in everything you look for in a place to call home. Discover why Dover, NH is ranked one of the Top 100 Places to Live by CNN/Money Magazine and rated the #3 Best Place to Live in NH for Millennials by Niche.com. MONTHLY SPECIALS - Lease now to take advantage of this month’s special.